PIC 360 owns a fleet of intermodal containers which can be leased for the transportation of either hazardous or non-hazardous waste. Our fleet of containers is specially designed to be used for transporting heavy waste of 65-100 pounds /ft3 per container. 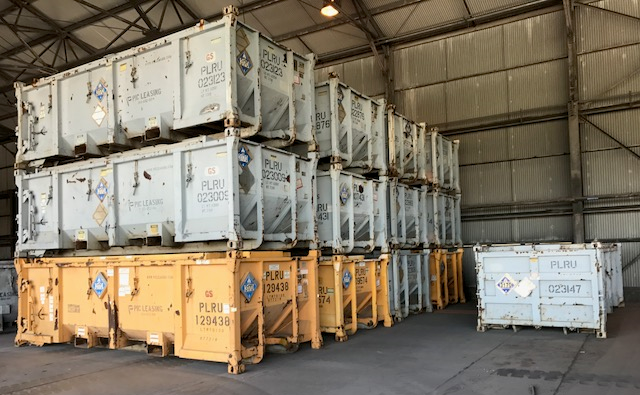 PIC 360 has been in business since 1993 and supplies containers to locations in North America for site remediation and industrial waste products. After a short analysis, we are able to recommend the best container and transportation packages to fit your exact needs. Our competitive, transparent pricing can be structured on a daily or monthly basis. You shouldn’t have to worry about what to do with waste material. Vented to prevent internal pressure accumulation. High visibility display of placards, serial numbers, decals, & tare weight. Meets AAR M-930-90, ISO, and CSC requirements. Learn how PIC 360 helps with your hazardous and non-hazardous waste management. You provide us with your needs, specifications, and delivery instructions. Together, we can determine whether it is more economical for you to lease or buy our containers. We build and modify our containers to meet your unique needs. Each container is inspected before delivery to ensure it will exceed your requirements. We arrange for delivery when the time is right for you. We follow any instructions you have for delivery locations. The container is ready to use as soon as you get it! PIC 360 offers maintenance programs that ensure the fleet remains in service and in compliance with regulatory and company requirements. Once you are finished with the container, we arrange for pickup of the empty contains (if they have been leased). Once we have them back, we repair and maintain the containers so they are ready for the next customer! PIC 360 provides unique solutions that meet your stringent waste hauling needs for a variety of industries. PIC 360 is always very competitive on rates and can quote on short or long term needs. Our rates can be structured on a daily or monthly basis. The rate is dependent on the length of term and whether the customer desires a maintenance program as part of the lease.